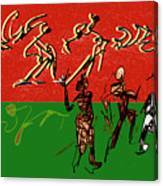 Rhythm And Soul by Anthe Capitan-Valais - 12.000" x 6.875"
Rhythm And Soul framed print by Anthe Capitan-Valais. Bring your print to life with hundreds of different frame and mat combinations. Our framed prints are assembled, packaged, and shipped by our expert framing staff and delivered "ready to hang" with pre-attached hanging wire, mounting hooks, and nails. There are no comments for Rhythm And Soul. Click here to post the first comment. 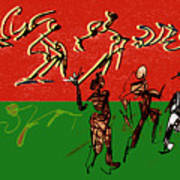 This piece was compiled of dance movements drawn during African dance studies at Swarthmore College and combined with the foreground dancers which were drawn while attending a faculty dance concert also at Swarthmore.My goal was to capture the intensity of the movements while holding onto the rhythm of the dance.